Exceltra's 200 Words a Day accelerated language-learning courses make use of the French colours to help you learn and remember new French vocabulary. This page explains how this simple technique can help your language learning. (This page is not about the names of the different colours in French. Click on the link to learn the French words for the different French colours). Why is it that so many words in French and English are similar? Well the answer lies in the history of England, and the English language. English inherited thousands of words similar to French words in three ways. Starting about 1100 years ago various swathes of Germanics swarmed across the Channel bringing with them more words derived from Latin. (Jutes, Angles and Saxons). The language of the Angles (anglais) came to dominate and was the basis of modern English. Then in 1066 the Norman French (William the Conqueror) sailed over to England, shot King Harry (a cousin) in the eye, bashed up the locals, and grabbed the throne. He then installed his barons and relatives into power, dishing out large expanses of English countryside to them, on which they built nice castles. These Frenchmen ran the country for the next 400 years and brought with them thousands of French words, names, influences and recipes. Thousands remain in use today. Many of these words are identical to the English, except that they need to said with a French accent, while contorting one's face, mouth and eyes into a French expression. Victor Hugo is credited with saying that English is actually just a form of badly pronounced French. To make it easier to remember that a word is similar in French and English we add the French colours, or the colours of the French flag - red, white and blue to the picture. (Sharp readers will pick up what a few people have written to us ... that the Tricolore's colours are actually blue, white and red). Exceltra's accelerated vocabulary learning lessons all incorporate a Memory Trigger picture for each and every word. Where the word is similar in French and in English we put the characters in to the French colours, or include a French flag in the picture. This way the French colours, and/or flag help to remind you of the similarity. 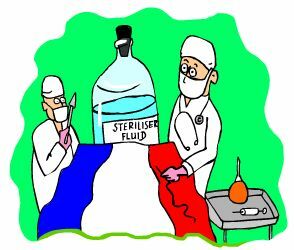 An example Memory Trigger picture is for the word stériliser, which is French for the verb to sterilise. Check out the cartoon pic on the left at the top of the page. Take a visual snapshot of this. Lock into your brain... and you will have a powerful way to remember another word. And remember when learning French, or any new language you will need to learn thousands of new words. Learning them with memory triggers, as is done in the 200 Words a Day language courses will make that job soooo much easier. Many verbs in English can be converted into French by adding the endings ER, or IR which are the common French verb endings. Many English verbs ending -ATE can be made into French verbs by replacing that ending with -ER. Over forty families of words can convert with a tweak here and there... e.g. Learning these forty+ families of words will turboboost your language learning to the extent that we have called these words French Turboboosters and have a whole easy, course on them which will increase your French vocab another 3,000 to 4,000 words in a month or less! The official name for these words is cognates. Also look out for our Spanish Turbobooster and Italian Turbobooster courses.